Produced for Klein Optical, we are pleased to introduce Klein 12 oz Ceramic Bistro Mugs. Featuring an elegant shape in a compact form, the mug comfortably holds one hot beverage with creamer. Each is enrobed in a sleek smooth-touch matte black exterior with precise laser-cut classic white Klein logo. A glossy interior, practical lip, and comfortable C-handle complete the drinkware design. 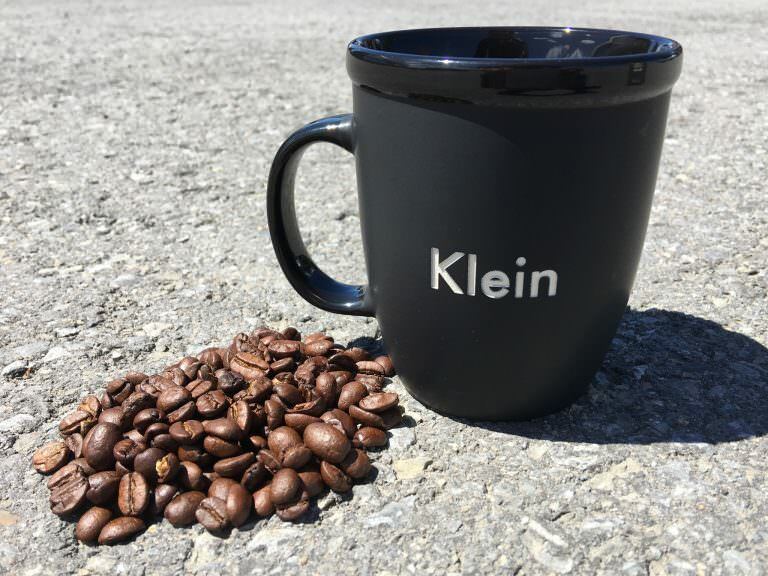 We invite you to enjoy a complimentary coffee or tea in a Klein mug in-store as you shop or while you wait during repairs and lens edgings. Strictly limited, these mugs are not for sale and have been distributed exclusively to friends and family of Klein Optical. However, we are offering our newsletter subscribers the chance to win one pair of Klein mugs each month. To be entered for this and future giveaways, subscribe to our newsletter below.